Short Depth Rackmount Keyboard 1U Sliding Drawer. KVM IP Rackmount 1U Keyboard PS/2 KVM Drawer. SUN Compatible Rackmount 1U Keyboard Drawer USB KVM. 1U Rackmount Keyboard USB KVM Drawer. 1U Rackmount keyboard with Cat5 Extenders KVM Drawer. 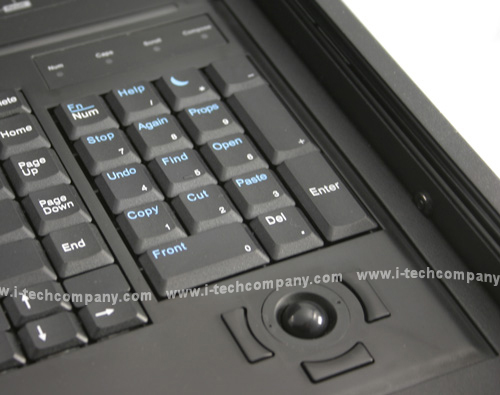 All of the Rackmount Keyboard comes with a Local port (Optional for Remote access console port) for Administrator to monitor its system either in Data center or at their desk top. At the local port this Rackmount Keyboard comes with local console port where you can connect this to your CRT or Rack LCD. Also Rack keyboard comes with 8 or 16 port KVM in PS/2 or USB connection. • Smooth-operating sliding rails that self-lock when pulled all the way out. For Remote access you can learn more from Netview KVM over IP technology where we move one step ahead from our competitors. We integrated this KVM over IP technology into rackmount keyboard. So, now you can remote access to your Servers from anytime and anywhere in the world without having to configure or install any software on your servers. Netview Remote access KVM over IP technology software runs on its embedded processors only but not on mission-critical servers, so that there is no interference with server operation or impact on network performance. Newview even go beyond the standard KVM over IP in market, we integrated our KVM IP technology into our Rackmount LCD Monitor keyboard drawer. NewView provides you the most selection in LCD sizes, which available in 15"/17"/19", plus it has options for 8 or 16 ports PS/2 KVM for your to connect your servers. 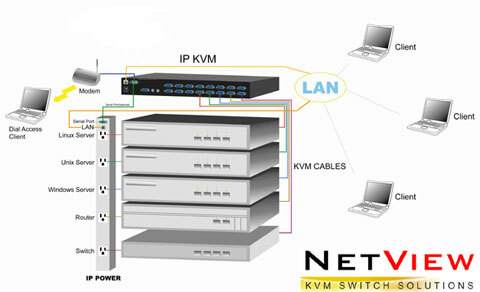 Netview's IP KVM(PS/2)switch provides convenient; remote KVM access and control via LAN or Internet. It captures, digitizes, and compresses video signal and transmits it with keyboard and mouse signals to and from a remote computer. Furthermore, NetView PS/2 IP KVM switch offers additional remote power management with the help of optional available device. NetView PS/2 IP over KVM switch supports consoles consisting of PS/2 style keyboards and mouse, and HD 15 video output. NetView PS/2 IP KVM switch will automatically detect the current video mode of the console, however manual fine-tuning is recommended to receive the best video quality. PS/2 IP-KVM switch will accept video streams up to 110 MHz dot clock. This results in a screen resolution of 1280x1024 pixels with a frame rate of 60 Hz. 3. Hot Plug - Add PCs or Remove Connected PCs for Maintenance without Powering Down the KVM switch or PCs. 7. At Remove console side Use SSL protocol for any encrypted network traffic between itself and a connected client. 10. Buzzer sound for switching port confirmation. 14. KVM (keyboard, video, mouse) access over IP and analogous telephone line.